If you’ve already created a website with Rapidweaver - you’ll now need to upload it to the WebMate web server in order for it be viewable on the net. This guide will take you through the process needed. Just enter the settings from your Welcome PDF into the site publishing settings (Under the 'File" Menu) in Rapidweaver. You can use Rapidweaver's 'Test Connection" button to check you have entered the correct information. If the connection test is successful you will now be able to publish your site to your WebMate Hosting by clicking the Publish Icon located at the top right of the Rapidweaver window. 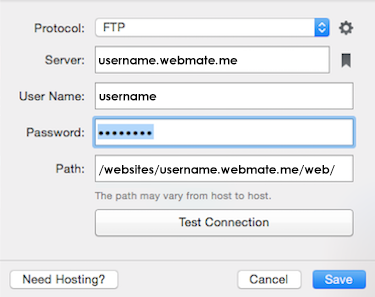 to Rapidweavers FTP publishing settings page. You should use your username.webmate.me as the server, or you can use a domain that you have attached to your site (yourdomain.com).